Takeaway: Internal and external factors are important considerations when selling a business. Here are issues you should think about when trying to time your exit. There are many factors that determine best timing for selling a small business: the financial condition of the company, valuation, growth cycle, profit history and the current market. Usually, the best time to obtain the highest price occurs when sales and earnings are good and trending upward. A solid earnings trend will enable a buyer to pay a higher price and still meet his/her return on investment criteria. A history of good performance also gives the buyer confidence in projected future earnings. Value is dynamic and proper timing makes a big difference in the prices paid for business acquisitions. External factors such as the economy, industry trends, competition, stock market volatility, investor confidence, interest rates and geopolitical considerations are cycles of constant change that impact value. Internal conditions within a company also change. Often in combination with external factors and sometimes independent of those factors. Changes do, and will, occur and they always tend to impact business value -- sometimes eroding value and sometimes increasing value. So how should you start thinking objectively about the best time to sell? 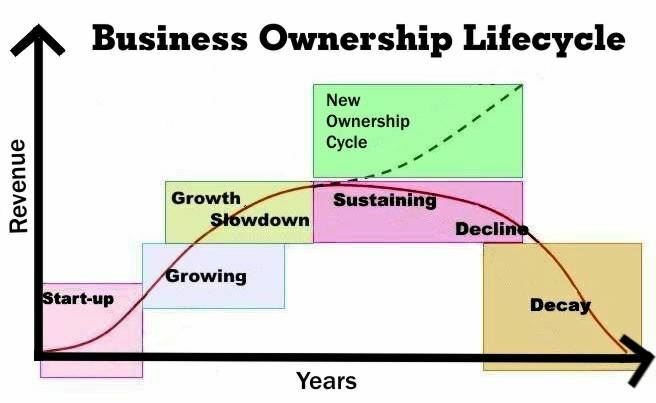 A good visual of right-timing would be to imagine the life cycle of your business plotted as a bell curve with the peak being the top of the growth cycle. The top is when you have reached the flat plane of growth...a sustaining mode. Buyers pay the best prices when they can't see the top, when the curve is still climbing upward. Once the top is visibly breached, buyers may pass on the opportunity or may pay prices based on a downward trend and a higher risk factor. If you wait until your revenues are already sliding over to the downside of the bell curve, you have waited too long. Your business has already started to retire before you have. To get the best deal, you have to sell on the way up. Markets change and fortunes change from year to year. The market for selling mid-market businesses will remain steady as baby boomers continue to retire over the next ten years. Buyers in every category are looking for alternatives to traditional investment avenues. They are looking for stability, better predictability and control. Business acquisitions offer all of these and can also offer a better return on investment than other investment opportunities. Is the Time Approaching to Sell Your Business?